Steeped in history, rich with tradition, the United States Botanic Garden (USBG) is a living plant museum that informs visitors about the importance, and often irreplaceable value, of plants to the well-being of humans and to earth's fragile ecosystems. More than 200 years ago, George Washington had a vision for the capital city of the United States that included a botanic garden that would demonstrate and promote the importance of plants to the young nation. Established by the U.S. Congress in 1820, the U.S. Botanic Garden is one of the oldest botanic gardens in North America. Since 1934, it has been administered through the Architect of the Capitol. The Garden has been recognized as a museum and is accredited by the American Alliance of Museums. This accreditation is a widely recognized seal of approval that recognizes a museum's commitment to excellence, accountability, high professional standards and continued institutional improvement. The U.S. Botanic Garden is dedicated to demonstrating the aesthetic, cultural, economic, therapeutic and ecological importance of plants to the well-being of humankind. The USBG fosters the exchange of ideas and information relevant to national and international partnerships. fostering sustainability and plant conservation. For the 21st Century, the U.S. Botanic Garden has committed itself to sustainability, educating the public about ways to live by supporting the interconnected web of life that is the environment, and in particular, by nurturing the plants that support the life on our planet. Learn more about the USBG's sustainability efforts through our short film America's Sustainable Garden: The United States Botanic Garden. With the continued support of the U.S. Congress, the U.S. Botanic Garden is committed to serving the American people. Just as our forefathers recognized the role of plants in the future development of the fledgling nation, there is even greater need today to renew our understanding of the importance of plants to the well-being of our citizens, our nation and the world. It is hard to imagine a more important mission. 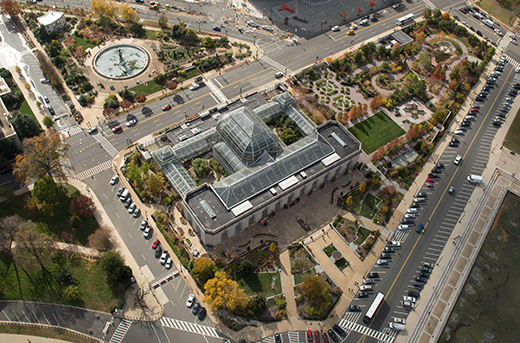 The U.S. Botanic Garden is a member of the American Public Gardens Association, the American Alliance of Museums, and Botanic Garden Conservation International.